Keith asked a good question about foliage at the end of the comments on "Snyder Swamp." He wondered if I used a palette knife technique for foliage in general, including distant trees and such. He asked, "I don't know if you used a similar technique for the foliage in the middle ground and across the swamp? I just started plein air painting recently, and was wondering how experienced plein air painters simplify foliage, sky holes, etc." The quick answer is that I use a palette knife technique quite a bit, not only for suggesting random leaf textures, but also occasionally for branches and tree trunks. I use the knife in combination with other tools, including a variety of brushes. 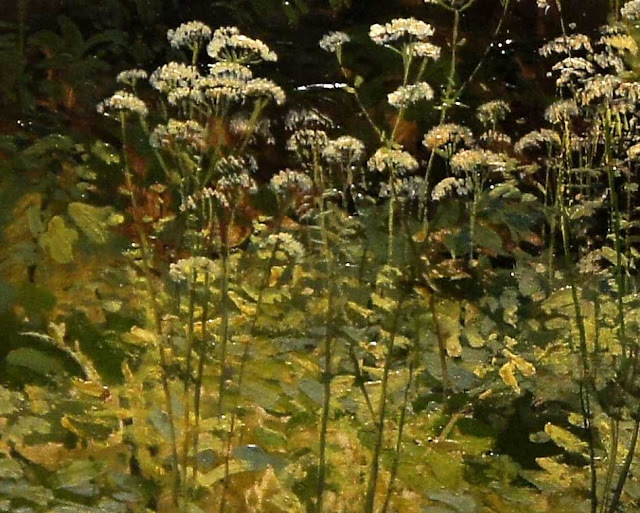 I find if I use just one tool, the foliage takes on the character of that tool, and the painting becomes about the paint strokes rather than the foliage. Let me back up a bit, since foliage is such a big subject. It's a massive challenge for most painters. A lot of people simply avoid foliage altogether because it's so hard to paint. It can't be reduced just to a discussion of tools or techniques. The key, I believe, is the understanding behind the technique. With the right understanding, you'll develop your own style of painting handwriting using whatever tools you find work best for you. So what I'd like to do is to share some thoughts about foliage over a series of posts, and use the work of artists I admire as examples. As a beginning, let me share one of my favorite foliage studies, painted by Ivan Shishkin. 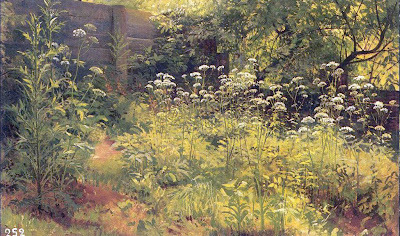 It's called "Goutwort, Pargolova" 1884 or 1885, 35 x 58.5 cm) This is a big file, so you can blow it up and study the details. It's just a weedy back yard, painted on location. It looks very tight and complete, but there's a lot of suggestion. I believe he established big soft masses first to cover the canvas, and then detailed the leaves mainly with a smaller pointed brush, light against dark, and dark against light, always thinking about the character and construction of the plant. He went all the way down to a very spidery stroke for the stems of those goutwort, which look to me a lot like Queen Anne's lace. That's where Shishkin was way ahead of the competition. He had a botanist's love of plants in all their variety. His critics dismissed him "an accountant of leaves." But that's not fair. As the study shows, he's really quite loose and spontaneous, and he never confuses the forest for the trees. I'll bet he painted this in less than four hours. And his painting goes beyond the photograph, which would capture this scene with an infinity of detail. So the first piece of understanding is this: Set up a progression from big shapes first to small shapes last, from soft first to tight last, and draw with the brush. That's a helpful truth with all sorts of painting, but it helps especially with foliage. Thanks for posting this. I love painting outdoors but always have a difficult time with foliage. I don't shy away from the challenge of painting it but am rarely satisfied with the results. So glad you will be doing a series on this. I purchased the Artistic Anatomy of Trees--recommended in another list of yours. Eager to add what I learn from your posts on foliage to what I am learning from the Cole book and other botanical texts--I don't shy away from trying foliage--but I am just never ever satisfied with my results. I work mostly in watercolr, by the way, but still learn from your posts even when you are working with oils. Thanks so much for your daily dose of great inspiration and information. I love it when GurneyJourney begins a series of posts on one topic. It's a fantastic way to absorb the content and think about each new thing learned before learning the next part. Thanks! Yes, thank you for posting this! Like Novice Naturalist, I primarily work in watercolors but have learned so much from your books and posts that applies to picture-making in general, regardless of medium. Thanks so much James. The timing is uncanny as I'm just starting some foliage studies for a larger painting. Very informative and generous of you as usual. This is such a helpful topic. I hate the thought of having to avoid anything because it is too complex. I'm looking forward to the rest of this series. I'm also looking forward to this series of posts. I find that plein air painting will be a beneficial tool set to any realism painter.